View more Art, Gifts, Jewelry & Decorations, & much more. & View our other Vintage Site at. 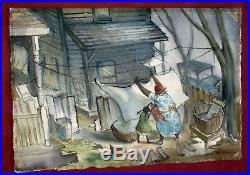 A nostalgic, Watercolor Scene – for those who desire. Original, higher quality Art (at an affordable price). 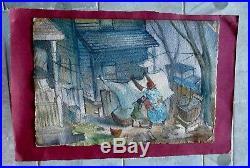 Lawrence Von Beidel c. Just another windy day in a rural backyard with chickens and. A Grannie rushes to secure the Clothes Line. While freshly hung sheets whip in the strong gusts, her little. Assistant attempts to help out. Washboard & Bucket -the way it used to be in the Early 20th C. S Pratt Institute B. He devoted his life to the Art World; both creating & teaching. A teacher of fine arts for 30yrs, he retired from. Watchung Hills High School where he had taught and inspired. For over 20 yrs as Dept. He was recently honored by. Induction into the Schools Hall of Fame in 2013. Von Beidel was a profession artist of exceptional technique. Equally comfortable in all mediums; and had exhibited at. The Montclair State College and other shows. (A great & kind soul)! Drawing was a 1964 gift from Instructor. Von Beidel demonstrating technique with Watercolor & Pencil. On textured surface to achieve mood and ambience. Front – lower right. 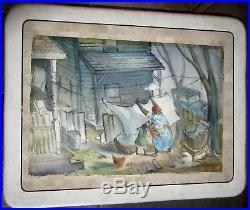 Rural Domestic Work Scene early 20th C. On heavy textured paper with deckled edge. Teal Blues & Greens w/ accent of Burnt Sienna. (without mat & unframed). < 5.8 oz. (23x 17x 1) // c. VERY GOOD Vintage Piece - no fading. > (back has a lesser, abandoned painting exercise by others). > Outer Edges of the heavy Watercolor Paper have irregular. > remnant traces of Mounting Tape in 4 corners & along outer. 14-1/2h x 21-1/2w image if matted. Full Size Top Mounting Display is recommended! With best attempts at accuracy. Art was stored in dry, climate-controlled environment. Photos taken in varied lighting. Computer Monitors may represent the colors differently. < all sales final >. States -Insured w/ Tracking. From Punta Gorda, S. Western Gulf – Florida. We are not a Store/ Retailer/ Wholesaler/ Trader. We are private, retired citizens attempting to clear our closets. (thus our final sale policy). Our quality goods are carefully stored in homes kept clean, smoke-free, & air conditioned. North Carolina – &. W/ Florida’s GulfCoast during the winter. 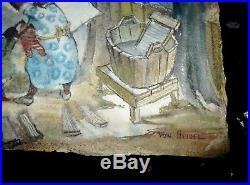 Most items are pre-owned and gently used; gifts & vacation buys; or inherited from family. Many items are VINTAGE: -aged but never used- or remaining inventory / floor samples. After a long decorating career as a Designer / Importer of high-quality European items with. Our Retail Furnishings Store closed in 1996. We spend considerable time preparing each listing and attempt to provide accurate and. Detailed information about every item. However, we are not an expert on every item and. Invite any contributing information from the Public! < We do not have a resale certificate. Please check additional costs! We will assist in helping you to process your claim on insured items. Save the damaged item. Unless there is a gross misrepresentation. Please avoid Buyers Remorse... Within 3 days of Item receipt - describing your concerns. >We accept a Return -only when the item does not substantially match the description. Provided & is significantly different than listing. We take pride in our products and would like nothing more than for you to have a. Positive experience when shopping with us. Misunderstandings may occur, so, in the unlikely event you experience any problems. Your satisfaction assures our success & we do our very best to encourage future return visits! 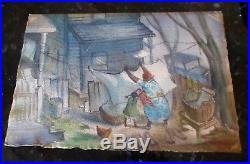 The item “BLACK AMERICANA Folk Art Painting- Orig. 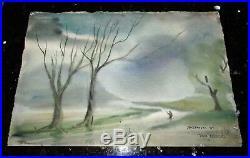 Large WATERCOLOR WASH DAY- c. 1964″ is in sale since Saturday, December 22, 2018. 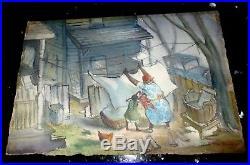 This item is in the category “Collectibles\Cultures & Ethnicities\Black Americana\Prints, Posters & Paintings”. The seller is “b.p.mtntop2sea” and is located in Punta Gorda, Florida. This item can be shipped to United States, Canada, United Kingdom, Denmark, Czech republic, Finland, Australia, Portugal, Sweden, Belgium, France, Ireland, Netherlands, Spain, Germany, Austria, Bahamas, Mexico, New Zealand, Norway, Panama, Jamaica. Matted Image Size: 14.5″h. x 21.5″ w.: Art Paper Size: 15″h. x 22″w. O.A.